Description : Avec une vitre. Hauteur : 25 cm. Largeur : 30 cm. Prix : Achieved a mileage of 1104 miles per gallon. 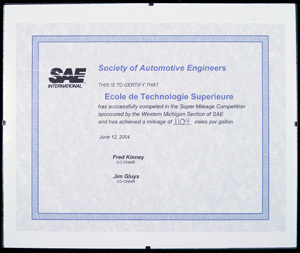 Notes : This is to certifiy that École de technologie supérieure has successfully competed in the Super Mileage Competition sponsored by the Western Michigan Section of SAE and has achieved a mileage of 1104 miles per gallon.